As one of the world’s weakest and most fragile states, Yemen faces challenges such as poverty, administrative and financial corruption, social and political turmoil, and, more recently, security risks. Such issues could lead to more violence while endangering the lives of Yemeni citizens, neighbouring countries, and the whole world. The Yemeni government has not been able to control its own territory, so Yemen is a fertile field for international threats such as terrorism, drug trafficking, and environmental destruction. The wave of the Arab Spring that swept over this fragile state from 2011 made matters worse and increased the security threats. The global community has worked diligently to prevent an all-out civil war from developing in Yemen and succeeded in bringing political opponents together at the negotiating table, in what is called the National Dialogue Conference. Despite the apparent success of the conference and of the steps taken to build a new Yemeni state, the reality has been different. In fact, the National Dialogue Conference was no more than a political arena for the conflicting parties. The parties were taking into consideration all possible scenarios, reformulating their positions and recalculating their next moves. For these reasons, the National Dialogue Conference faces huge difficulties on the ground, particularly some major security challenges. · The continuing conflict at various levels within the state system, especially between the adherents of two former regimes, that of Sunni political Islam, represented by the Islah Party and its allies, and that represented by Ali Abdallah Saleh, the former president, and his military, political, and civilian allies. The major developments that took place in September 2014, when the Houthis took control of Sanaa, were a result of the divisions within the networks of ruling elites that had controlled Yemen for 33 years. In 2011, Ali Abdallah Saleh’s political allies in the Muhaisini faction turned against him, which led to his removal from office. In response, Saleh sought revenge and rehabilitation. 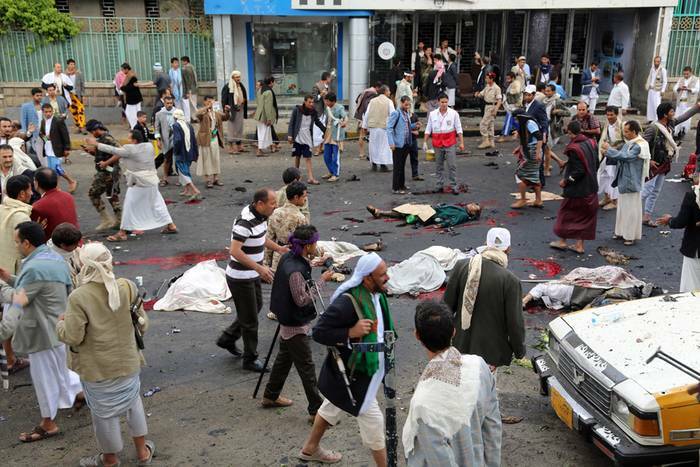 This indeed took place when the Houthi group had been able to remove the Muhaisini faction from the centre. Regardless of the role that Saleh and his supporters played with al-Houthi, what is important is the type of spiralling conflict that is taking place. After the Houthis took control of Sanaa, they received many threats from fanatical Sunni Islamist groups, that took an ideological, rather than a political, approach to the crisis. Consequently, there is a fear that the Iraqi civil-conflict model will be transferred to Yemen by fanatical Sunnis and Shiites. A good example of this was the suicide bombings that took place on 9 October 2014, during a demonstration by the Houthis, and resulted in the deaths of approximately 70 people and the injury of approximately 90 others. Al-Qaeda claimed responsibility for the bombing. The sectarian conflict is being fuelled by the weakness of the internal parties that are in conflict and are seeking support from regional sectarian forces, for example, the Houthi-Iranian connection and the Saudi connection to multiple tribal, political, and Sunni groups. As a result, the resolution of conflicts in Yemen will be linked to the resolution of regional conflicts, especially that between Saudi Arabia and Iran. The extent of Iranian support for Shiites in the region is often exaggerated, but perceptions matter, so the Houthi advances are of concern to the Gulf states and other world powers. This is because, in their eyes, Houthi control of Yemen would mean control of the Red Sea, Bab al-Mandab, and the Gulf of Aden, especially the world trade routes that traverse them. Also threatening security are the demands of factions in the south for separation from the north. The old demands will become especially strong if the Houthis manage to take control of the entire country.